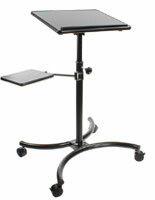 These Notebook Stands are Ideal for Trade Shows! This Display has a Matte Black Finish! 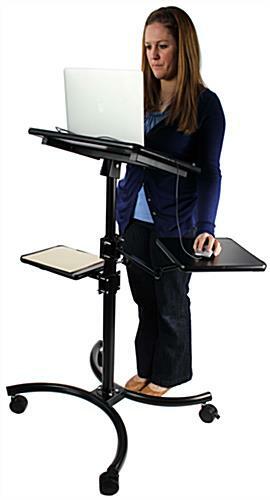 These Notebook Stands have (4) Wheels for Mobility! Height adjustability can reach up to 55" tall! Tilting surface can reach an angle of 25°. These notebook stands have a matte black finish. With two additional shelves below the work surface, users have plenty of room to store any items they need. 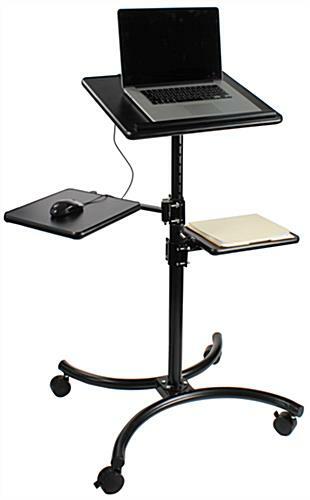 These height adjustable notebook stands can be set as a presentation counter, or adjusted down to be used as a work station. 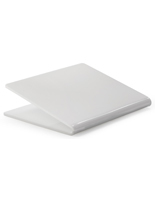 The work surface on this portable laptop display can be angled for optimum working conditions. Each of these notebook stands that have an ergonomic design have a matte black finish that blends with any setting. 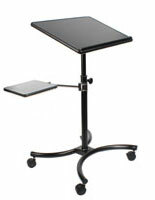 The 20" x 16" stand has a lip at the bottom to prevent any items from sliding off. These black notebook stands have a curved base that look great for presentations. This unit features two height adjusting shelves for storage. 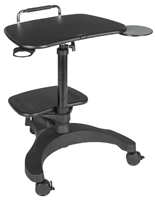 The stationary shelf on these notebook stands that have a matte black finish are ideal for projectors or other multimedia devices during presentations. The second shelf is on an adjustable arm that measures 20.5" long. This specific shelf on these notebook stands that are for residential use can be spun and angled anywhere. These portable computer displays are mobile as well. There are four casters, two of which lock, that easily move these notebook stands around or keep them stationary as needed. 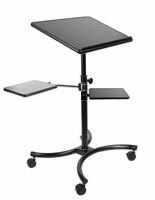 Beyond presentations, this laptop desk is great for residential and commercial use. Plenty of desk space on these computer displays, notebook stands make them ideal for a personal office or work space.